I love autumn, and I’d like to enjoy the last of it before Christmas creeps up on me. Did you know that’s a thing now? “Christmas Creep?” I heard it on the radio the other day. Apparently, it’s a new noun meaning the act of Christmas creeping further and further towards Halloween. Forget Thanksgiving. Christmas has already “creeped” over that. So in the autumn spirit, here’s a pretty simple, autumn recipe full of colorful ingredients perfect for the fall season. This recipe easily fills two baking sheets, so if you’re going to double it, keep that in mind. I will say, however, that making extra wouldn’t be a bad idea, since the leftovers taste great too. Preheat the oven to 475 degrees. Cover two baking sheets with aluminum foil. Spray the foil with nonstick cooking spray. 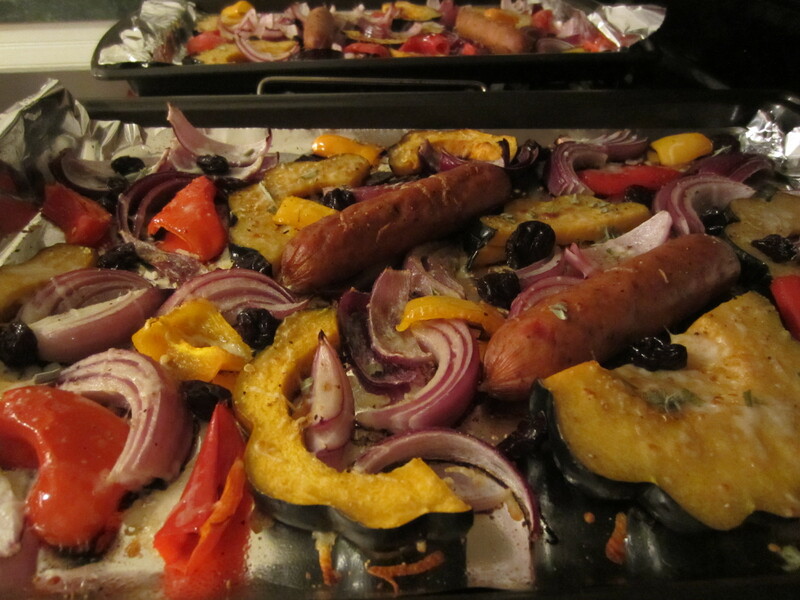 Evenly distribute the peppers, onions, squash, and sausages on the baking sheets. 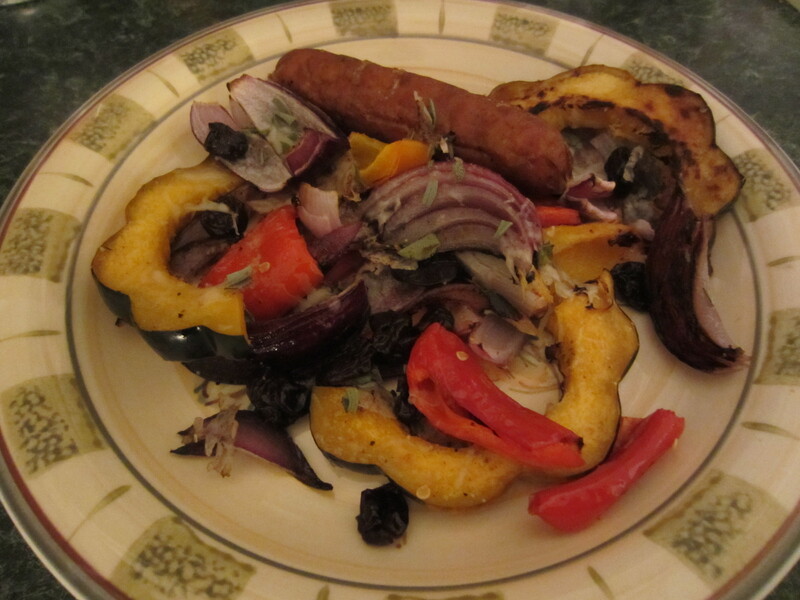 Bake for 15 to 18 minutes, or until squash is well roasted and soft when pricked with a fork. Remove from oven and sprinkle evenly with the Italian cheese blend. Broil for 1½ to 2 minutes, or until cheese begins to melt. Scatter sage leaves and dried cherries over the cheese. Serve immediately. Jenny Craig: Works great for lunch or dinner!